Don't let it ever be said that I don't share the less than stellar performing projects. After a couple of months on this water cooler - building, then disassembling, then building again, I have shelved it and moved on to WC8. It's not that it didn't work, it's just that it didn't meet my expectations. However, it did bring a few problems to light that I had not had to deal with in previous coolers. If nothing else, I did document the procedure with some of the details missing from previous cooler articles. 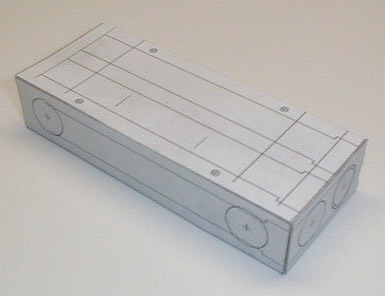 As usual, my design starts out with a scale drawing taped to the aluminum stock to allow me to work out any obvious errors in design. Getting a drill bit not to "walk" away from the intended starting point is difficult. I lessen the problem by twisting an X-acto knife to get a reference point which gives me a place to start the drill bit. 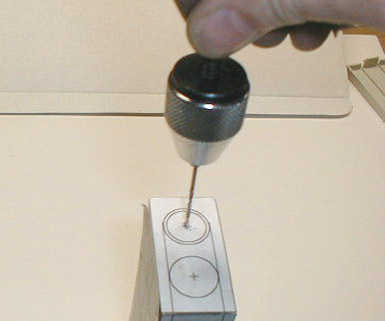 I then use a small twist drill in a miniature chuck to get the hole started. While this is a bit time consuming, my holes are rarely off by more than a few thousandths. This is closer than I can get with the drill press alone. 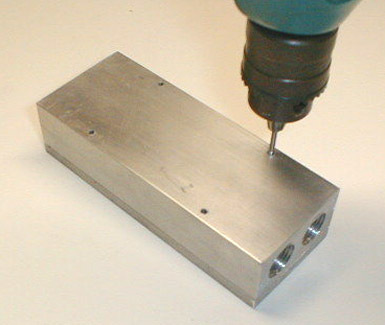 Drill the holes with ever-increasing sizes of bits until the correct diameter is reached. The second to last cut is just a fraction under the desired diameter so the last cut doesn't have to dig through too much stock. This makes for a cleaner hole. 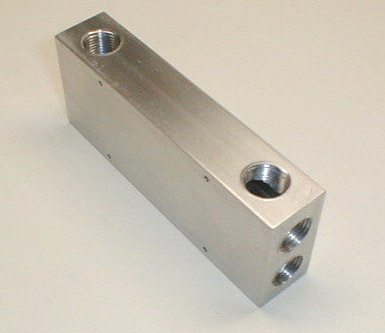 Each hole was then tapped to 3/8" NPT. With the pilot holes already done on the drill press, I ream out the cold plate mounting holes to their final diameter. This step also cuts the holes in the cold plate which is taped to the bottom of the block. This insures that the plate and block will line up exactly. 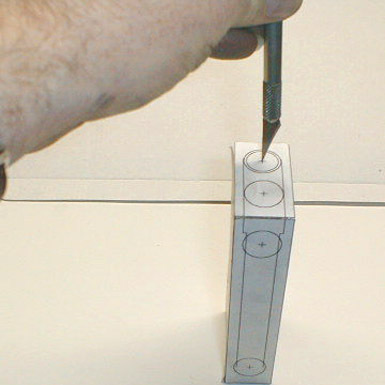 When your tools aren't perfect, a trick or two helps to get a good fit.